I have had an incredibly stressful week, which will continue throughout my work-filled weekend. Seriously, there are not enough hours in the day. When I am up to my eyeballs in work, I like to eat. I like to eat sweets. After waking up a couple times with a food hangover this week, my new mission is some healthified stress food. 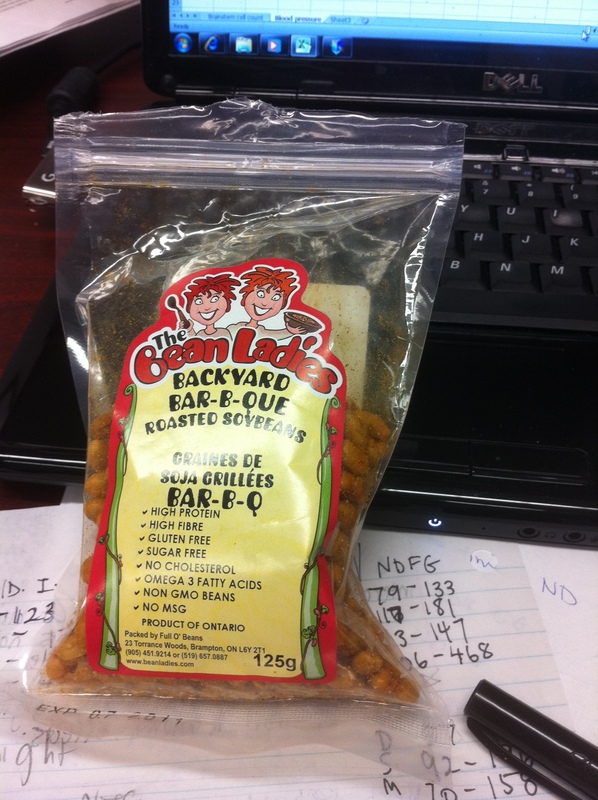 Snack food 1: Roasted soybeans. Nice crunch. Only a hint of soy. High protein, high fiber, gluten free, salt free, cholesterol free….I could continue. There’s a lot going on in that little bag. By far the best flavour I’ve tried thus far is apples and cinnamon. Lovely to conquer sweet cravings. A couple of small scoops of chocolate pudding mix stirred vigorously into some greek yogurt (more or less pudding mix depending on your taste) . I put it in the freezer for a bit in hopes it would become frozen yogurt-esque but I was too excited, and took it out to eat about 5 mins later. I added in some Reese’s pieces, you know, just so the chocolate didn’t get lonely, and ate it up! Super tasty and packs a great protein punch! I know The Bean Ladies! You should try the dill ones! Scrumptiousssss!!!! I’m so sorry that you’re stressed! But it sounds like you’re handling it really well. I like how you kept the chocolate company with the Reese’s, lol! When I’ve been my most stressed, I like to try and tap into it. When I get super anxious, there’s no use in trying to make the anxiety go away, so I just try to go with it. I’ll turn on crazy loud music and dance. I know. Kinda lame, right? But seriously, it makes me feel so much better and then I can go back to the stuff stressing me out and feel more energetic. Flo Rida FTW! I definitely just took your advice and danced to loud music 🙂 thanks! That is a yummy looking little snack! I used to freeze greek yogurt mixed with pb and it was always so good. 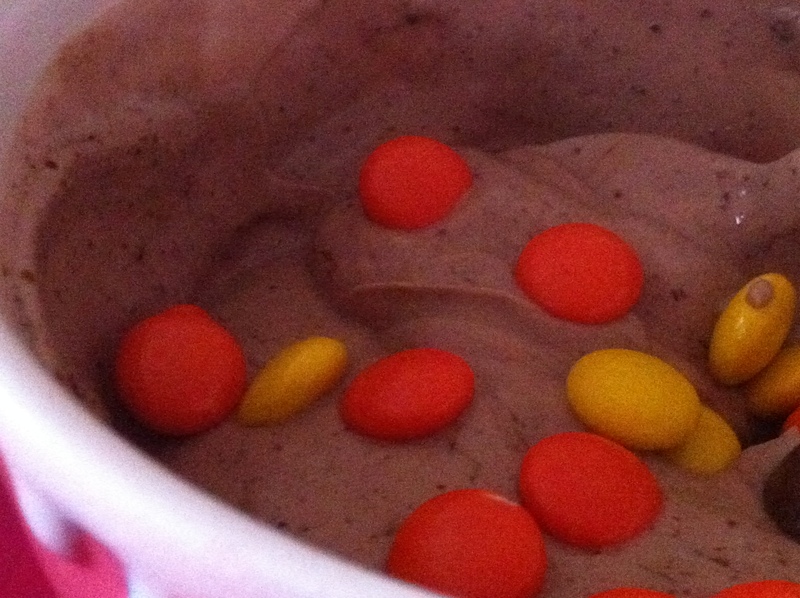 Adding Reeses Pieces is always a good thing though! Ah what a good idea to add pudding to your greek yogurt! PB & Choc = love. I eat so many sweets when I’m stressed too! I’m so with you on this one. I eat when I’m stressed, too! If I’m super stressed, carbs are my calling! Well, how about a talking dog instead? 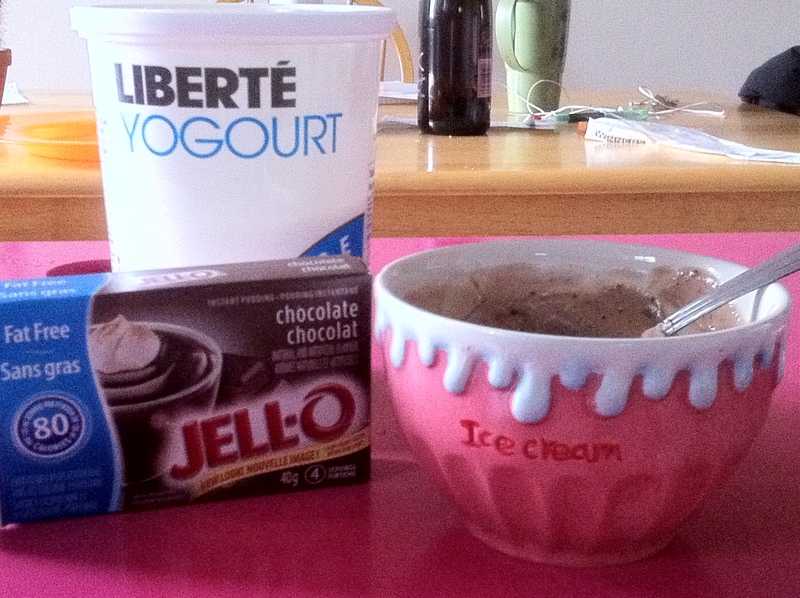 Neat idea to mix pudding mix into greek yogurt! I’d definitely add more chocolate too, ha. Oh and that ice cream bowl is super cute! I want one now. I am probably the weirdest person ever, and when I’m stressed I kind of binge-eat bell peppers and carrots, and I turn orange. I mean, some chocolate will sneak in there too 😉 and diet soda. GRRR. also, i compeltely feel you on being super impatient when freezing things. I always put stuff in the freezer and then want it like 30 seconds later. Also what happens when I make chia puddings… I just want them NOW.